Thank you and Goodbye 2015! 2015 was by far the most successful year for me. At some point, broke my heart as well. My kids graduated from college, thus, husband and I went to the Philippines. Kids moved back to the United States for good and both landed a good job. I got a job in the mine which was my dream job. And thank God everyone has been in good health. I am very thankful and grateful to the Lord Almighty for all the blessings that I received. I felt so very blessed that sometimes I would think that I do not deserved them because I thought I have sinned enough to make the Lord spank me or something like that. But as a friend have told me, Lord Jesus meant to blessed me and that it was not a mistake. She added that the blessings I received are meant for me and I deserved them. Amen! Every parent's dream is to see his/her kids finish school. I have witnessed mine this year. It was very fulfilling. Because it was an important occasion, hubby and I traveled to the Philippines. We had a great time! Seeing my family, relatives and friends again are priceless! My kids returned to the United States for good and eventually got a job, both on their first interview which is pretty amazing. I bid out a job in the mine and I thought it was okay if I don't get it because I believed that I can't be that lucky or I can't have everything since my kids just got a job but I was very surprised that it was offered to me. I was the happiest person on earth that time! It would have been perfect until I heard a very sad news. My very good friend Vanessa demised. It was truly heartbreaking. My trip to the Philippines in the future will never be the same again without her. I will miss her forever. 2015 has given me bittersweet memories. 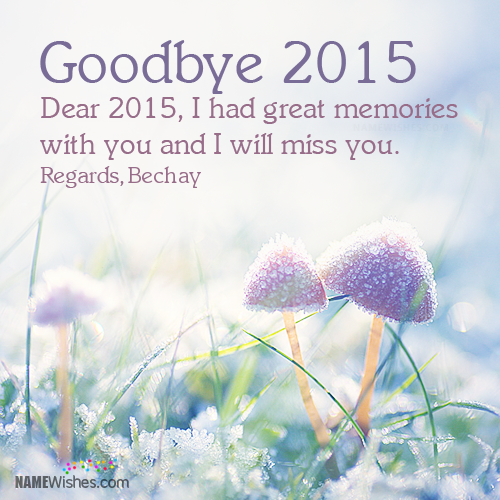 Thank you and goodbye 2015!